UFC on ESPN+ 3 went down from the O2 Arena in Prague, Czech Republic earlier today (Sat. February 23, 2019). Dwight Grant ended the ESPN 2 prelims with a bang. He finished Carlo Pedersoli Jr. with one second left in the first round with a TKO. That kind of sequence was worthy of a $50,000 Performance Of The Night bonus. Also, Michał Oleksiejczu made a statement on the main card by toppling UFC veteran Gian Villante. He dropped Villante with a body shot before finishing him off on the ground. Oleksiejczu’s first-round win was awarded with Performance Of The Night, and an extra $50,000. In what was likely the last fight of his career, Stefan Struve also banked $50,000 for Performance Of The Night. The longtime UFC heavyweight submitted Marcos Rogerio de Lima in the second round by way of arm-triangle choke. And in the main event of the night, Thiago Santos defeated Jan Blachowicz with a third-round knockout. “The Hammer” uncorked two huge hooks that ended Blachowicz’s night. 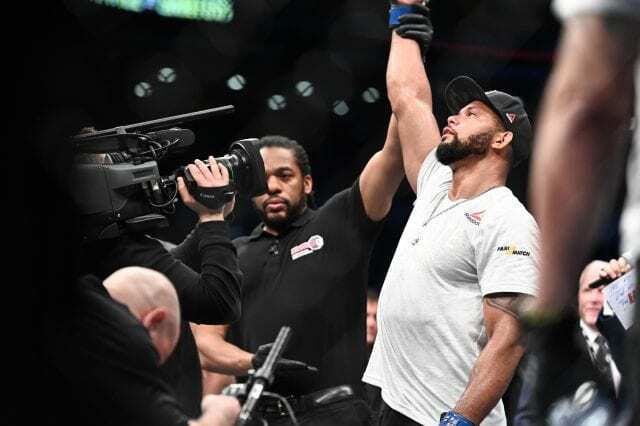 After the bout was over, Santos called out the winner of Jon Jones vs. Anthony Smith at UFC 235 next week. Santos will also take home a $50,000 Performance Of The Night bonus.